I recently had a client ask me this question, “How do I prevent investors from forwarding my pitch deck to my competitors?”. We’d finished putting together a stellar pitch deck that accurately conveyed their awesome business concept/company. I detailed how they were doing things differently than all of their competitors and made clear the unique value that they were bringing to the table. If you’re seeking funding, you’re going to need to share these things with potential investors. They need to know why your company is a good investment opportunity. How they can be more confident that that investment will yield returns? You have a great, unique, defensible business of course! But that information can feel scary to share. What if they steal the idea? What if they tell other founders in competitive businesses about it? What if they forward your pitch deck and all of your most special and important secrets to the world? In some ways this is a reasonable fear. You’ll be sharing really detailed information about various aspects of your company and strategies. It is normal to feel like (a) these strategies are why you are and will be successful, and (b) that it would be very detrimental if the got in the wrong hands. In other ways though, this may not be a reasonable fear. It is usually the case that the people with the right strategies AND the right execution are the ones that succeed. Not just with the strategies. It’s the team’s hard work, blood and sweat, pounding the pavement, key connections and partnerships, that really make a business successful. Also, if someone had your idea, your strategy and plan, would they even want or have the time or drive to do it? Investors certainly don’t. They are not in the business of starting businesses, they are in the business of investing in businesses. They are looking for good deals, good opportunities, and fun ideas to back. Not to run. All of that said, ok, so you want to protect your valuable information as much as you can while seeking funding, right? Here’s how to do it. You have a couple of options of varying degrees of effectiveness for controlling the share-ability and confidentiality of your pitch deck. First off, always send your pitch deck as a PDF. This should be a no-brainer. Never send a PowerPoint, Keynote, or Google Slides document to anyone outside of your company (except your designer of course). You do not want anyone to have access to the root data behind all of your slide, charts, graphs, etc. Worst case scenario: with the source files, someone could go so far as to change the logo and color of your deck and pass if off as their own. Never send the .PPT file! Another big reason why not to send the PowerPoint is compatibility. You do not know the machine (PC or MAC), the Microsoft Office version on their computer, or the fonts they have on their machine. If any of these is different than yours, it can make images in your slide deck wonky and text unreadable. The solution is to only send your pitch deck as a pdf. You’ll likely design your pitch deck (like we do) in a slide design tool like PowerPoint, but when you are done, you should save the file as a .pdf before sending as an attachment to an email. Now unfortunately, whenever you do send something as an attachment (like a pdf) there is not much you can do to prevent the forwarding saving or sharing of that attachment. One way many founders try to protect themselves and their company is through legal language and confidentiality notices. Some founders add a confidentiality notice slide in the deck itself; this often includes legal jargon covering the validity of the projections and securities related disclosures (ie: relating to FINRA Rule 2210 and the SEC). You can also add confidentiality and “do not forward” notices in the footnote on each of the slides. Though, if you’re curious about the enforce-ability of these kinds of disclosures, speak with your lawyer. In the emails you send with your pitch deck attached, you can write “do not forward” or other similar requests to your recipients. But in the end, these are really just requests and cannot guarantee that the people that get your deck in their hands will follow them. The only way I know of to ensure that no one forwards your deck, is to host your deck using a deck/file hosting platform. In these cases, you would share links with your potential investors rather than the file itself. There are a lot of different tools that allow you to do this. And they all vary in features, price, and how “locked down” you can make your deck. We often recommend PitchXO to our clients; and we have even helped clients set up their profiles on the platform. Pitch XO lets you send custom access links and see which of your invitees have logged in, what they looked at and for how long. The tool is nice because it allows you to create a whole series of tailored, branded webpages, and you can upload a number of different files. You also are able to restrict access to certain files to certain people and get feedback from your mentors on pitch deck iterations. It’s pretty seamless and user friendly to both you and your investors. The only real downside is expense, and there is always a chance you’ll turn-off some investors who don’t like links and prefer files. These two are very similar in my opinion. They both are not exactly made for pitch deck hosting per say, but they can solve that need. Both were primarily built as online PowerPoint competitors that have increased collaboration. I find these tool much less robust that PowerPoint and other more traditional slide design tools. Slide bean focuses heavily on templates >> See what I think about template here <<< And Slides.com is more focused on sharing and feedback. Both have an interesting “live presentation” feature for remote presenting built in. They also both allow you to password protect or restrict your files and see metrics on how much people have read and how long they spent on certain slides. Though this is only in aggregate not for individual viewers like with Pitch XO. For some of the tracking and password protect features they do cost a monthly fee. Surprise surprise! So again, the only real downside is expense, and there is always a chance you’ll turn-off some investors who don’t like links and prefer files. If you currently use Dropbox or Box or another file sharing platform, it can be a good option for hosting your pitch deck. It hosts all of your other files sharable by a link, why not your deck? Depending on the level or your subscription and the features of your file sharing platform, you may or may not have password protection, individual access granting rights, or download restrictions. These tools usually don’t give you view history or metrics either. It also can feel slightly less professional to send your files through these tools. These are great tools for founders seeking funding for their startup. All three offer an opportunity for entrepreneurs to create a profile and share information about their company to investors at large. These sites, to my knowledge are more about sharing your files that protecting them. They may not be what you’re looking for if you’re concerned about privacy. That said, they are all worth checking out for their other valuable features for fund raising, startup management, filings, incorporation assistance, posting jobs, finding cofounders, and applying to accelerator programs etc. Don’t forget though, that there is some value in having a deck that CAN be easily forwarded. The investor community is a small one. Venture capital firms know trusted Angels investors that they send deals to when a startup is too early in their life cycle for the VC. Investors who focus in certain fields or industries, may know other investors who are interested in your business’ industry even if they aren’t. Even when an investor is on board, they may want to connect you to a friend that they think should also get in on the deal with them. All of which is much smoother for your investor when your deck is in a forwardable format. The better question may be, is your deck forward-able?  Does you pitch deck excite and interest your investors, does it accurately and engagingly tell the story of your startup? Is it professional? If not, we may be able to help. Need things fine tuned or preparing for a big live pitch? Let’s schedule a pitch review and coaching session. Need a full overhaul of the visuals and flow of your pitch deck itself? Our custom pitch deck design packages may be a good fit.